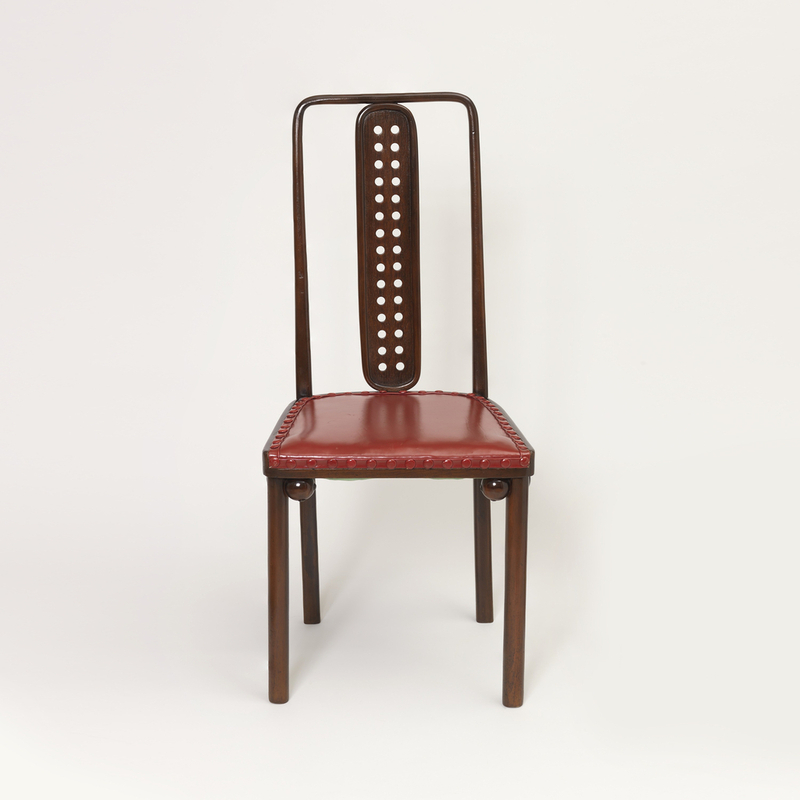 A ubiquitous figure in design history, Josef Hoffmann had a career that spanned more than 50 years. The Austrian architect-designer created this chair for the dining room of the Purkersdorf Sanatorium, located just outside Vienna, and built between 1904 and 1906. Hoffmann designed both the sanatorium’s austere exterior and much of its interior. Hoffmann worked in the principle of unity in architecture, interior decoration, and furniture, following the German composer Richard Wagner’s idea of a “total work of art”—Gesamtkunstwerk in German. The chair’s rectilinear form and perforated decoration reflect the design of the dining room, the building, and other designs by Hoffmann—particularly his textile designs and metalwork. 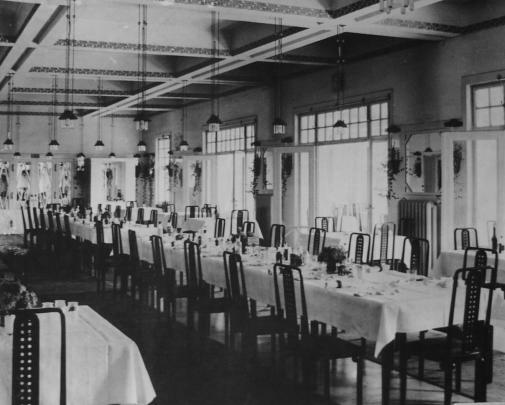 A 1904–1905 photograph of the dining room shows an elongated table in its center surrounded by a suite of bentwood chairs, like the one in Cooper Hewitt’s collection. Rectangular forms are seen throughout the room. One side of the space is flanked with large glass doors intermixed with radiators and mirrors, while the beamed ceiling above forms a grid-like pattern. Like most of the sanatorium’s interiors, the dining room’s minimal decoration is astutely geometric. The Purkersdorf Sanatorium was a hygienic place of science and rest. It served to cure patients suffering from “nervous ailments” as opposed to mental illnesses. The overall design of the sanatorium—including this chair—show Hoffmann’s fastidious attention to functionality and purpose. While ornamental, the perforated circular decoration also provides ventilation, lightness, and ease of mobility. The chair’s frame is made of a lightweight material, beechwood, which has been bent and laminated. The wooden balls in the crooks of the chair’s legs where they meet the seat help stabilize the joints. The chair is both attractive and functional, reflecting the larger context of its commission. The chair embodies what art historian Christian Witt-Dörring has graciously said of Hoffmann’s furniture designs, “His accomplishments make all the more incomprehensible today’s revival of the tendency to deny that a practical object can be an expressive work of art.” The chair is a champion of turn-of-the-century Viennese Secessionist design and Hoffmann’s own discernment as a designer. Christian Witt-Dörring, “Furniture and Wooden Objects,” in Josef Hoffmann Designs, ed. Peter Noever (Munich, Germany: Prestel, 1992), 23.